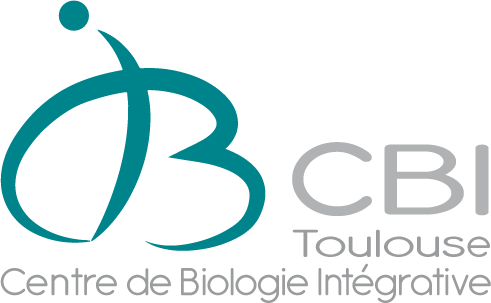 The cell imaging facility of CBD constitutes the core of a large platform, Toulouse RIO imaging (TRI), recognized at the national level by IBiSA coordination. TRI coordinates the imaging facilities of eight research institutes in Toulouse. As a whole, TRI provides environment, materials, expertise and technical assistance for technical and methodological support of all scientific projects which use cell imaging in its many aspects, from basic fluorescence microscopy to sophisticated aspects of this rapidly evolving field, including confocal and multiphoton microscopy, wide field and deconvolution microscopy, Fluorescence Lifetime imaging (FLIM), Single Plane Illumination microscopy (SPIM), Total Internal Reflectance fluorescence (TIRF), whole-body and intravital imaging, Single Particle Tracking (SPT), tomography in electron microscopy and EM cryo-methods. Scientifics fields currently covered are extremely diverse (molecular and cell biology, developmental biology, microbiology, immunology, physiology, cancer, ecology, neuroscience, chemistry…). CBD itself hosts four large facilities : 1) a fully automatized wide-field microscope equipped with deconvolution software for non-invasive live cell imaging, which can be used for medium throughput analyses; 2) a confocal microscopes equipped with spectral deconvolution for multilabeling experiments; 3) a multiphoton microscope equipped with fast resonant scanner for rapid, non-invasive and deep in vivo tissue analyses; 4) an inverted confocal microscope equipped with heating chamber and GASP detectors for live imaging in vertebrate tissue. CBD imaging core facilities are operated by an engineer (IE CNRS), Brice Ronsin, who has tremendous expertise with all the above technologies and develop new methodologies on its own such as fluorescent protein activation or conversion in defined volumes, second harmonic imaging and optogenetic. As for the whole platform, CBD imaging core facilities are opened to all partners in research and development, in public as well as private domains, without geographical, thematic or institutional restriction. Therefore, anyone can have access to the equipment (after having successfully completed the appropriate training) through the on line reservation system of the platform. Similarly, the management of CBD imaging core facilities is integrated in the platform at large and defined through a quality chart (ISO 9001 standard), which allows efficient and operational functioning and development of the platform. Access to the CBD imaging core facilities is through a Web site (http://tri.genotoul.fr/), a common portal to all equipment and expertise irrespective of their location. Photoablation for cell biology, 25-29 juin 2012, Journée réseau FEMTO. The goal of the imaging facility is to propose technologies for single cells and high content analysis dedicated to the diversity of biological models: fission yeast, mammalian cells and drosophilia tissue. Development and implementation of novel technology was particularly developed in our laboratories. Indeed, the first major difficulty is to propose high dynamical time scale imaging facilities because biological phenomenon proceeds through cycles lasting from seconds to hours. Therefore, multiscale analysis that allows fast 3D imaging, high field superresolution imaging, molecular scale analyses and biomechanical measurements is crucial to propose integrative model of cell functions (motility, mitosis, DNA repairs and morphogenesis). The policy of our laboratories is to propose a perfect link between the developments of methods from biophysics with recent imaging facilities. This approach simplifies the different strategies of quantitative bioimaging needs for biologist and allows realistic investments for integrative imaging approach. Finally, this approach helps us to develop hardware, microtechnology and algorithm specific to each need in close collaboration with others institute or company. Widefield imaging with optomanipulation device (FRAP, photoactivation, Photoabalation). This system is installed in the laboratories since 2006. This system was recently used (since 2009) for the studies of tension during mitosis , tension generated by apoptotic cells in drosophilia tissus , and DNA damage . Furthermore FRAP with variable volume allows us to analyze complex molecular diffusion rate in chromatin or cytoplasm. Widefield imaging couple with force and friction spectroscopy by optical tweezers, microfluidic and microppatterning. The system combines fluorescent imaging with force and friction spectroscopy by optical tweezers. This system was totally developed on the laboratory (MRCT funding in 2012) and allows highly dynamic temporal spectroscopy (100Khz to 0.01Hz). Thanks to a new strategy of analysis from biophysics this setup allows direct measurements of force generated by molecular motor on cargo and low level of cells adhesion without any hypothesis. The setup also allows mecanotransduction study with specific fluorescent protein. High content screening facilities. Operreta high content screening system has been installing to propose automatic analysis from high population of cells. These technology is combine with specific algorithm for Cell migration analysis, RNAi screening, transcription factor, cells shape change, cell proliferation and differentiation analysis. Columbus image data storage and analysis system is combine with the high content microscope that propose safely storage and propose secure access to images from a wide range of sources via internet. Specific microppatterning and microfluidic technologies can be implemented on this machine for unbias high content screening. 3D imaging by differential spinning disk (DSD). This setup has been recently installed to answer crucial need for 3D vivo imaging of drosophilia biological tissus. This new technology of optical sectioning gives the best axial resolution for tissus imaging. Leica SP2 Confocal imaging. This setup has been installed for help crucial needs in fixed 3D imaging of drosophilia tissus. Image correlation spectroscopy (ICS) facilities. The analyse of the spatial and temporal fluctuation of fluorescence from widefield or confocal imaging gives many information about protein diffusion. Image correlation spectroscopy (ICS), Temporal Image correlation spectroscopy (TICS), Temporal Image correlation Spectroscopy (STICS), K-space ICS and Raster scanning correlation Spectroscopy (RICS) will be implemented during 2014. This specific need have been proposed to study actin and myosin dynamic in collective cell migration , focal adhesion and podosome adhesion dynamics, and long distance interaction along biopolymer fiber like chromatin and cytoskeleton. The LBME, together with the LMGM, has set in the past 10 years an efficient fluorescence microscopy platform, which is more specifically, but not exclusively, dedicated to live imaging of unicellular organisms (bacteria and yeast). It comprises 2 wide-field video-microscopes (1 equipped with a FRAP module) and a spinning-disk confocal microscope (see Appendix 2, p. 163). In addition, as indicated above, the LBME recently acquired a PALM/STORM super-resolution microscope. These microscopes are managed in the framework of the Toulouse Imaging Network (TRI), an IBISA platform that coordinates all cell imaging platforms in Toulouse. The microscopes can be booked on-line (http://tri.ups-tlse.fr/) and LBME or LMGM staff ensures training (see Appendix 2). Similarly, the LBME groups have also access to several cell imaging facilities in Toulouse with high-end microscopes (confocal, bi-photon, FLIM, SPIM, TIRF, AFM…) and cell sorting. Importantly, a new engineer (IE-CNRS) will join the LBME on December 2014 to supervise the IBCG fluorescence imaging platform. Videomicrocope #1: Olympus IX-81 inverted microscope with motorized stage and objectives, monochromatic excitation, filter-wheel on emission, multiple filter combinations, cooled CCD camera (Coolsnap HQ, Roper). Set-up driven by computer (Metamorph software). Allows acquisition of z-stacks with multiple fluorophores and time-lapse experiments. A thermostated chamber can be adapted to the stage. Videomicroscope #2: Nikon TI-E/B inverted microscope with motorized stage and objectives (piezzo motors), illumination HG intensilight, multiple wavelengths, perfect focus system, FRAP module with laser illumination, Hamamatsu Orca R2 CCD camera, Hamamatsu ImageFM EM-CCD camera, large thermostated chamber, anti-vibration table. Allows acquisition of z-stacks with multiple fluorophores, live microscopy, observation of small objects (stable focus) and low signal (highly sensitive camera). Spinning-disk confocal microscope: Andor Revolution system. Olympus IX-81 inverted motorized stand equipped with a CSU22 Yokogawa confocal Scanner Unit. Illumination with 4 lasers. Two EM-CCD allow simultaneous visualization of 2 fluorophores. Large thermostated chamber with gas regulation. Allows live confocal microscopy with multiple wavelengths on very small organisms, even with low intensity signals. Super-resolution microscope: Nikon TI-E/B SPT PALM. Fully automated set-up very close to videomicroscope #2. Camera Andor EM-CCD IxonULTRA. TIRF illumination for PALM acquisition. Large thermostated chamber with gas regulation. Allows acquisition in PALM microscopy for super-resolution imaging. The LBME runs the Multi-scale Electron Imaging (METi) platform (www-meti.biotoul.fr), a core facility that offers advanced microscopy techniques for molecular and cellular imaging. The LBME ensures the scientific management of the platform (scientific managers: P-E Gleizes; C. Plisson-Chastang), which is operated by two technical staff members (technical manager: Stéphanie Balor, IE UPS; Vanessa Soldan, AI-UPS). Beyond classical sample preparation and observation, we have now improved this facility to perform advanced techniques including ultrafast freezing, cryo-sectioning (Tokuyasu technique, CEMOVIS), cryo-microscopy and electron tomography. The personnel was trained through international training sessions and visits to specialized laboratories. This facility, which is quality-certified iso 9001, is part of the IBiSA TRI Genotoul network (see above). It is open to academic and non-academic researchers. Recent developments include cryo-microscopy, electron tomography, CEMOVIS. A new website was opened in 2013 (see below). The equipment of the platform is entirely described on this site, together with a description of the available service and some achievements. Please refer to www-meti.biotoul.fr (English version available).